Confocal laser endomicroscopy (CLE) is a promising and new in vivo imaging method for biological systems. The main feature of CEL is providing a real-time histologic and cytologic examination through endoscopy. The realtime evaluation permits for preliminary comprehension on vascular, epithelial, papillary, and ductal structures [1, 2]. This technology can be accomplished either by an endo-microscope attached to either an endoscope or colonoscope (endoscope-based CLE) or by a probe placed on EUS-FNA needles (probe based or needle based CLE) [3, 4]. The first approach is generally useful for imaging accessible luminal and ductal components. On the other side, needle based confocal laser endomicroscopy (nCLE) is preferable to visualize solid organs such as pancreas, liver, and lymph nodes . The nCLE can also role as a suitable substitute for rapid on-site evaluation (ROSE) which is based on immediate cytological staining during EUS-FNA . The nCLE is generally accomplished by placing a miniprobe on the top of 19 or 22 G needles during EUSFNA . This modification has distinctly promoted the diagnostic utility of endoscopic procedure. Through the nCLE process, tissues are illuminated using laser light, and the reflected lights are then recorded into grey scaled confocal images by a computer [3, 6]. For obtaining high resolution images, there is a need for introducing fluorescent dyes; i.e. fluorescein which is administrated intravenously and acriflavine which is employed locally . Before nCLE can be used as a routine technique, it ought to be validated regarding safety and accuracy issues. Furthermore, stablishing standard diagnostic criteria is also a perquisite. Several studies have been conducted aiming to provide guidelines on the imaging features of cystic pancreatic tumors on nCLE. These include INSPECT study by Konda et al. in 2013 , CONTACT 1 study by Napoléon et al. in 2015 , and DETECT study by Nakai et al. in 2015 . The main feature of pancreatic cystic lesions on nCLE has been the presence of regular villous structures . This feature yielded sensitivity and specificity values of 59% and 100% respectively, with positive and negative predictive values of 100% and 50% . Presence of irregular cell aggregates within an irregular vascular network hued with fluorescein may suggest adenocarcinoma . Generally, the presence of thick dark (>40 μm) and thin white (<20 μm) bands, irregular dark objects along with visualized epithelia structures (as either villous or glandular), as well as fluorescein leakage in the tissue suggest a malignant phenomenon . In contrast, thin bands (either white or dark) propose a non-neoplastic condition . On the other hand, dominance of fibrotic tissue in the context of irregular glandular compartment is suggestive for chronic pancreatitis . Good feasibility for various pancreatic lesions and well tolerability with the least adverse effects are also among noteworthy benefits of nCLE . However, the procedure has been reported with pancreatitis as a complication in 3-9% of cases [3, 9]. Other reported complications included abdominal pain and intra-cystic bleeding . The immediate benefit of real-time visualization of tissue structures via high resolution nCLE can be ruling out the malignant nature of the lesions in early phases. An inevitable delay in diagnosis of the malignant transformation is one of the major drawbacks of available routine diagnostic methods. 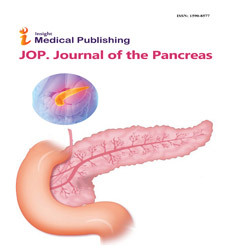 Beside the fact that malignant nature of pancreatic tissue may be missed during conventional ERCP, delayed diagnosis due to inconclusive histological findings may further deprive the patients from timely interventions . The nCLE have shown comparable sensitivity and specificity (98%, 67%) respective to histological examination (45%, 100%) for detection of a neoplastic process . The nCLE is a novel approach that can provide invaluable information on the features of pancreas cysts, however, standard criteria needs to be developed and validated. It can render high sensitivity and specificity when combining with other diagnostic methods. There is a need for developing standard criteria for diagnosis of pancreatic lesions using nCLE. The authors had no conflicts of interest.